ANN ARBOR, Mich. — The newborn baby of a Michigan mother who refused recommendations that she abort her unborn child in the midst of a battle with an aggressive form of brain cancer, and instead decided to forgo treatment in order to save her baby, has now died just two weeks after her mother passed into eternity. As previously reported, Carrie DeKlyen, a mother of five, was diagnosed with Glioblastoma Multiforme in April and was accepted for a clinic trial at the University of Michigan. However, in meeting with doctors at the facility, she was informed that she was pregnant and would need to obtain an abortion in order to proceed. DeKlyen had two brain surgeries to remove the tumor, but it returned both times. 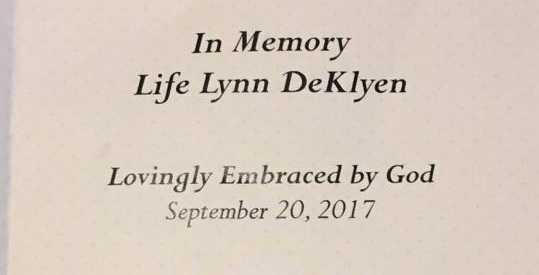 In July, DeKlyen suffered a stroke and never regained consciousness. Family and friends hoped that she would stay alive long enough for her baby to be safely delivered. On Sept. 6, doctors performed a Cesarean section on DeKlyen, delivering her daughter, named Life, at a gestation of 24 weeks, 5 days. She weighed 1 pound, 4 ounces. At first, it was reported that the baby was doing as good as could be expected, but earlier this week, the Cure 4 Carrie page noted that Life had taken a turn for the worse and was struggling with low blood pressure and low oxygen levels. Skin-to-skin contact from her father seemed to help, but on Wednesday evening, Life died. Nick DeKlyen is now caring for the couple’s five other children: Elijah, 18, Isaiah, 16, Nevaeh, 11, Leila, 4, and Jez, 2.